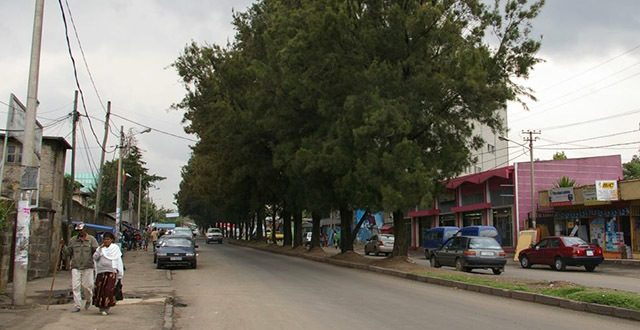 Positioned right around the center of Addis, Kazanchis is one of the oldest parts of town. Kazanchis was one of the places where our fathers went for a little jamboree. Stretching from about four kilometers from the palace down to Urael church, Kazanchis still reflects the soon to-be-forgotten swinging jazz days of Addis. It’s an area that still refuses to be quiet at night. After decades of longing for a piece of Kazanchis, investors and the Richie Rich have finally got to it. Sadly, it’s changing quickly and in fewer than 10 years from now, there will likely be only hotels and mixed use buildings that tell no story of how things use to be. Since you can find those 60-year-old, wooden-floored houses hidden behind all the cafes and bars, renting a house can be a bit cheaper than in the other, more central, parts of town. I’ve seen two- and three-bedroom houses that are being rented out for no more than $600 USD a month. With all of the ongoing construction in Kazanchis, more and more apartment buildings are popping up and adding new options to the choice of housing. The rent for a two bedroom apartment on one of these newly built buildings would be somewhere from $650 to $800 USD based on whether the apartment is furnished or not. Kazanchis is now also the home 4 and 5 star hotels so if you are in Addis just for a few days, there is that option of spending more than a hundred dollars a night. Kazanchis is a place where you can get plenty of same item vendors that inexplicably seem to cluster close together. There is an abundance of stationary shops in Kazanchis and also quite a few shops for computer accessories. You can also find a few boutiques along the main road but that’s about it. Kazanchis is not a shopping haven. There are a lot of small local cafes and restaurants where you can stuff your face with $2 meals so it is simply awesome for the non-snobbish. But the small, cheap restaurants mostly only serve Ethiopian dishes. There are also some nice restaurants where you can find more expensive European fare. Lime Tree – With the UN right behind it, Lime tree can get pretty busy around lunch time. It’s a nice, small place with good service. And for the lemonade crazed, they have a pay for one and have unlimited lemonade rules. So go crazy. Kabana – Opened no longer than a year ago, Kabana is the new addition to those who crave Caribbean. Their menu includes delicious Caribbean dishes like oxtails and jerk chicken. The owner is mostly there and super nice so if you’re not happy with what’s on your plate, you should not hesitate to send it back. Romina – Once the party spot of Kazanchis, Romina has now turned to a decent restaurant with a decent menu. The food is decent and slightly cheaper compared to the other nicer restaurants in that area too. There’s a whole lot of ‘decent’ at Romina! If you are out for a fun night involving alcohol and some boogie boogie there are a couple of nice places in Kazanchis that you can go to. Plus there are heaps of those small local bars with extremely loud music and prostitutes that some might prefer to go to. Liquid Lounge – Liquid is a nicely designed lounge in the heart of Kazanchis. They have a DJ playing dance music throughout the week but it is only packed on the weekends. Which is good for the ones who go there not for the dancing but for a tête-à-tête with a few drinks and hookah. Club Voltage – This club is lcoated inside the Intercontinental Addis Hotel. Even though they have they have nice couches, a big dance floor and a DJ, they still have not managed to fill the dance floor. But they do host some fun parties and events there every now and then. Fendika – Fendika is a small traditional restaurant that has been around for a long time. The owner is a renowned traditional dancer and is still one of the performers there. It is usually packed with expats and diaspora who are there to see these performances while sipping on Tej (honey wine). The owner also invites old and somewhat forgotten Ethiopian musicians to Fendika and gets them to perform for his audience. When faced with the atrocities of different sorts of life, Guta likes to tell people that his day time job is branding and communications and that he has no middle name to differentiate him from all the other Gutas in Addis Ababa.